Master wheelman pilots the ultimate track weapon for your viewing pleasure. If anyone knows how to drive fast cars it's Sebastian Vettel. The four-time F1 world champion joined the Ferrari team this year and one of the perks of the job is being able to delve into the Prancing Horse's rich portfolio. Filed under ultra-exclusive and/or completely insane is the Ferrari FXX K. There will be just 32 units of the the LaFerrari-based track-only experimental supercar, which comes packing cutting-edge technology and a powerplant that unleashes 1,036 horsepower and over 664 lb-ft of torque. 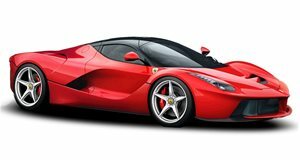 Ferrari claims it can lap Fiorano in 1 min 14 secs, a full five seconds quicker than the LaFerrari. So this is not a machine your average driver can handle. Obviously, Vettel is not your average driver. Watch and learn from the German maestro.